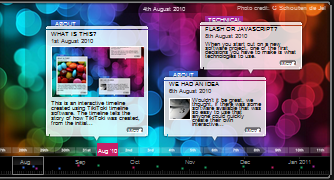 TikiToki is a great application for multimedia timelines making . It allows its users to create stunning animated timelines. TikiToKi is very easy to use and above all its basic version is completely free . This is a web tool that lets you create, collaborate on, and publish zooming/planning interactive timelines for free.It is like Google Maps but for time. Ourstory enables you to write stories, tag friends, and add media to collaborative timelines either privately or in public. Capzles is a web tool I have reviewed here a couple of times. It lets you create rich media experiences with videos, photos, music, blogs and documents. Read Write Think has a beautiful timeline tool that allows users to add project labels and easily create timelines. Xtimeline is a free web-based timeline that you can use to easily create and share timelines with pictures and videos. TimeToast is another great tool that allows you to create timelines and share them on the web. The process only takes a couple of minutes and is very simple to use. Dipity is a free digital timeline website. Users can create, share embed and collaborate on interactive, visually engaging timelines that integrate video, audio, images, text, links, social media, location and timestamps.